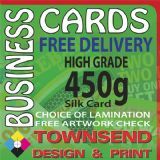 Our 450gsm Business Cards are Litho printed on state of the art full colour presses. Cards are printed single or double sided and come with a choice of finishing options and turn around times to suit your time scale and budget. Soft Touch Lamination now available. High quality low priced business card printing! Full colour print! Single or double sided. Soft Touch lamination available at great prices! Free delivery! !